Today's Stage 8 was one for the breakaway men, while two contenders launched testing attacks that ultimately came to nothing. On the day's first big climb, right out of the gate, Cadel Evans set off, with Vladimir Efimkin, David Zabriskie, Egoi Martinez, and Christophe Kern in pursuit of Sandy Casar. The group would grow to include Fabian Cancellara, George Hincapie, and Thor Hushovd, who had seen Mark Cavendish off the back, and collected enough intermediate sprint points to take the green jersey for tomorrow. The presence of Evans in the break put Astana on the defensive, and they slowly reeled it in. Cancellara exchanged words with Cadel Evans, and the broadcasters felt he was accusing Evans of not working, but I think Cancellara wanted Evans to go back to the field, and give the fairly strong escape a chance to make a break that could stick (Evans confirmed on his site: “Pro cyclists start carrying on like 3 y.o's in a temper tantrum when a G.C contender in their break is no longer to their advantage. Oh well, that's racing, and a little bit to do with why you don't often see serious GC threats in breaks - usually a waste of energy... Landis and Rasmussen have been the exceptions in the last few years.”) As Evans was recaptured, Luis Leon Sanchez and Mikhail Inatiev bridged to the escape, which was finally given some room to roam by the peloton. Later, early on the climb of the Col d'Agnes, Andy and Frank Schleck turned up the heat, shedding riders faster than Rock Racing, Yellow jersey Rinaldo Nocentini was among those dropped, but none of the overall contenders, so the Schlecks came off the front and the peloton reformed. As the climb progressed, the leading group shrank, until over the top, 4 riders rode alone at the front of the stage: Sanchez, Efimkin, Mikel Astarloza, and Sandy Casar. Efimkin refused to work in the break, since his teammate Nocentini could potentially lose his race lead if the break gained 4:10 on the field, so he looked to the freshest on the run-in. With 5k, Astarloza was the first to attack. When Sanchez responded, Efimkin went hard up the left curb, and gained about 5 seconds on his former breakmates. Closing to the line, it looked like Efimkin might have the stamina to hold the trio off to the line, but well into the final kilometer, Sanchez finally got across. As he did, Casar attacked hard, but Sanchez expected it, grabbed his wheel, checked the back door for Astarloza or Efimkin, and powered by for the stage win. The field came in at 1:54, led in by Sanchez teammate Jose Rojas. 7) Peter Velits, Team Milram, s.t. 8) Sebastien Minard, Cofidis, s.t. 9) Jeremy Roy, Française des Jeux, s.t. 10) Thomas Voeckler, Bbox Bouygues Telecom, s.t. The King of the Mountains jersey also changes hands, moving over to Christophe Kern of Cofidis. Astana falls out of the team classification lead, now trailing AG2R-La Mondiale by a scant 3 seconds. Mark Cavendish delivered the goods Sunday, easily outsprinting the field in Brignoles. Cavendish won four stages in last year's Tour, but didn't win the overall green jersey because he dropped out to concentrate on the 2008 Olympics in Beijing. That didn't work out so well. Cavendish has said his goals for the Tour are just to win a stage and make it to Paris, but wearing the green jersey tonight, he's got to be thinking bigger. The victory was Cav's 15th this season, and continues the Columbia team's amazing run -- they won 6 stages of the Tour de Suisse (with 5 different riders) in June. Garmin-Slipstream's Tyler Farrar played the sprint just right, finding and holding Cavendish's wheel, but just couldn't find the terminal velocity to stay with the Manx Express. Romain Feillu was 3rd, Thor Hushovd 4th, and Bbox's Yukiya Arashiro, one of two Japanese riders making the start this year, was 5th. No sign of Tom Boonen, who may have been caught by a crash in the final kilometer, and was 174th on the stage. For much of the day, four riders: Jussi Veikkanen of FdJeux; Stef Clement of Rabobank; Stéphane Auge of Cofidis; and Cyril Dessel of AG2R, rode alone, and Veikkanen collected enough King of the Mountain points to take over the lead in that competition. That makes him the first Finn ever to wear the polka-dots in the Tour. 3) Romain Feillu, Agritubel, s.t. 4) Thor Hushovd, Cervelo Test Team, s.t. 5) Yukiya Arashiro, Bbox Bouygues Telecom, s.t. 6) Gerald Ciolek, Team Milram, s.t. 7) William Bonnet, Bbox Bouygues Telecom, s.t. 8) Nicolas Roche, AG2R La Mondiale, s.t. 9) Koen de Kort, Skil-Shimano, s.t. 10) Lloyd Mondory, AG2R La Mondiale, s.t. Every year, I run down the riders' countries of origin, with special attention to the English-speaking countries. Here's last year's, for comparison. Seven is up from four last year. Gone is Will Frischkorn, left off the Garmin team, but back are Armstrong, Zabriskie, and Leipheimer. Tyler Farrar starts his first Tour. Not just more riders, but riders with more chances -- 3 guys with Top 5 hopes, and Farrar stage-hunting. Down from 9 last year, with Robbie McEwen recovering from surgery, Baden Cooke riding for the Continental Vacansoleil team, Trent Lowe home, and Simon Gerrans and Adam Hansen alternates. Michael Rogers is back. Matthew Lloyd makes his first Tour start. 7/3 Update: With Tom Boonen back in the Tour, Allan Davis stays home, reducing Australia's count to 6. And a half, given Heinrich Haussler, who lives and trains in Australia. Chris Froome's Barloworld squad is not in the Tour this year, back is Bradley Wiggins, and Wegelius returns thanks to Dekker's EPO positive. Cavendish has to be the pre-Tour favorite for green, and his success or failure will be one of this Tour's major plotlines. Tour rookie Roulston joins the returning Dean. With Martin's tendinitis, Roche will be the first Irish participant since Mark Scanlon in 2004. Roche is reigning Irish road champion, having dethroned Martin last weekend. After ending a 10-year Canadian drought last year, Hesjedal returns. With no Barloworld participation, Robbie Hunter and John Lee Augustyn won't make the start for South Africa. So what's Lance Armstrong's endgame for 2009 Tour? originally uploaded by Frank Steele. Like a lot of folks, I was surprised to see Chris Horner left off the Astana Tour squad, but I completely understand why Johan Bruyneel did it. Certainly, after publicizing his desire to get out of his contract and race the Tour with another team (despite 2+ months of racing season still to come after the Tour), I wouldn't look for Horner back with Astana next year. Of course, given the financials, it doesn't look like anyone will be riding for Astana next year. Bruyneel's made a career (as rider and DS) out of playing the percentages, and the percentage in the hand that he's got is to ride Contador to a 4th Grand Tour title (VeloNews story shows gamblers agree). There are plenty of teams that would let a rider with his pedigree and palmares stack the team with those teammates he feels give him the best chance at wearing yellow in Paris. If the Garmin rumor is true, Jonathan Vaughters was going to sign not just Paulinho but also Noval to support Contador. You could make an argument that it's not Paulinho's selection that left Horner out in the cold, but Muravyev's, or even Armstrong's, both of which are for political reasons. 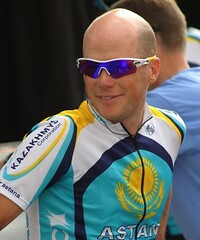 Muravyev is a hat tip to the team's Kakakh registry, while Armstrong is here for the publicity and excitement he brings to the team's coverage, and in recognition of his enormous place in cycling history. A bigger question, though, is “What's Armstrong riding for?” I don't know exactly what his goals are for this Tour, but I don't think he will be riding for the overall win. Certainly, he's showing up in great condition, and as a competitor, he's got to believe that he could win, if certain things happen on the road. But this Tour lines up better for the climbers than the TT men, and Contador has shown he's an extraordinary climber. That said, I have a hard time believing Armstrong will be happy carrying bottles for anyone, even the 2009 Tour winner. So what could Astana carve out that would satisfy both Contador and Armstrong? Other than the maillot jaune, the only other jersey that Armstrong could reasonably contend for is the polka-dot jersey, but no sane team is going to let Armstrong ride off on a multi-peak points hunt, unless he's already down by tens of minutes, and that's how recent maillots pois have been won. Armstrong certainly could find himself in position to chase stage wins, and there are even a couple of stages that might further polish Armstrong's reputation. Most obvious is Stage 20 up Mont Ventoux on the penultimate day of the Tour, which looks like the biggest stage of this year's Tour. As the marquee stage, there will be a lot of riders eyeing this one, and my guess is it will go to somebody who's more of a pure climber than Armstrong, like Andy Schleck, Robert Gesink, or Carlos Sastre, depending on the race situation. Armstrong himself, though, has expressed his regrets over Mont Ventoux, where he feels he “gifted” Marco Pantani a stage in 2000, and where he was beaten by Richard Virenque in 2002. “I left unfinished business there,” he told Versus. So, sure, maybe Armstrong's got a circle around Stage 20 on his calendar, but I think his presence here is more about the other half of the “Contador to Garmin” rumor: The 2010 Livestrong-Nike team. Presumably, Johan Bruyneel will be trying to match his UCI license to a sponsor after this season, and Livestrong and Nike are already close partners, with a new “It's About You” ad campaign that launched over the weekend and events planned in conjunction with the Tour. Would Armstrong be the uncontested leader on the road of that team, or did he come out of retirement to launch it with maximum fanfare, after which he'll return to retirement? We'll all know soon enough. Armstrong spent today pre-riding Stage 16 (and here's video -- note that he's training in Livestrong gear, not Astana), one of 6 stages he's pre-riding. So what do you think? What's Armstrong looking to take away from this Tour? You can comment here, or on Twitter, where I'm @TdFblog. Spelling out the worst-case scenario for Astana: a T-Mobile like glut of teammates riding for the win, domestiques who will only ride for “their guy”, dogs and cats living together, etc. Should be an interesting three weeks. Astana named the final three riders to its Tour squad this morning: Gregory Rast, Dmitriy Muravyev, and Sergio Paulinho. It's the first Tour for Muravyev, a pro since 2002, and 3-time Kazakhstan TT champion. He's Astana's only Tour rookie. Left off the Tour roster were Chris Horner, Jani Brajkovic, Thomas Vaitkus, and Benjamin Noval. Versus should do whatever it takes to get Horner in the booth as often as possible; he could be the next Bobke. With Lance Armstrong apparently planning a new team for 2010, and Alberto Contador, one of five men to win all three Grand Tours, the stage is set for a potential Lemond-Hinault style intrateam rift. The team is presented in a very professional Flash presentation that would have made a great introduction for a Livestrong-Nike team, currently running in place of the team home page. (Click through for a larger version of the photo above, which I shot at Stage 4 of last year's Tour de Georgia, at Road Atlanta). The CyclingNews.com article mentions speculation on the team's possible 2008 roster, but Vaughters refused to jump the gun, announcing rider signings before September 1. “I have signed a lot of high-level riders,” CN.com's Mark Zalewski quotes Vaughters. Bart Hazen at Daily Peloton offered rumors of possible Team Slipstream signees in a Tour preview on Saunier Duval in early July, including David Millar (openly attached to Slipstream in the British press), David Zabriskie, Christophe Laurent, Thomas Voeckler, David Cañada, Marcus Burghardt, Martijn Maaskant, and Jerome Pineau. Vaughters will continue the team's anti-doping program, one of the most extensive longitudinal programs in the sport. The team will be in action in August at the Tour of Ireland. Looks like the Tour will start in Monaco in 2009. Le Parisien reported today that the '09 prologue will be 15.2 kilometers through Monaco's streets. Tour director Christian Prudhomme has said he wants to shift to more international starts, moving from 50-50 foreign/French to 3 international for every 2 French starts. Next year's race starts in Brest, in the northwest Brittany region of France.